Over the past few months I’ve been conducting a business experiment. It has to do with those ever-spreading grid-wide hunts. You probably know all about them, but if you don’t, they’re simply very lengthy treasure hunts, made a whole lot easier by extensive use of teleportation and landmarks. You start at the first landmark, and by finding the potentially impossible-to-find hidden item, you get the clue (and a free gift) to proceed to the next hunt location. It continues through a long string of locations, sometimes numbering hundreds of stops. Those stops are, of course, SL stores. Participating in a hunt as a vendor takes some effort; it’s more than just dropping a goofy-looking sombrero in an obscure corner of your carefully designed shop. There are usually a lot of things for shop owners to do during the hunt. Typically torrents of group notices flow by, usually to rearrange the order of the hunt due to dropouts or ejections. Policy matters evolve or dramatic incidents occur. Hunters themselves sometimes require assistance when they get lost or give up. And you have to create a truly unique and interesting gift to attract people back to your store. So why would a shop owner would bother to take on this extra work? The theory is that the flow of hunters will result in increased sales: while they’re frantically searching through your shop looking for that pink-ribboned halibut, they’re certain to be amazed by the top quality of your for-sale items and snap up a blingy purseful. I had to know. I entered a series of hunts over the past several months. Today I examined the stats from such three hunts, including one of the biggest: the May-June SL Discovery hunt, which involved over 500 SL stores across the grid. 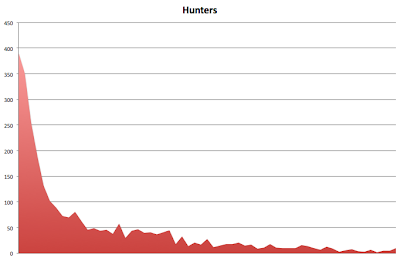 I also examined statistics for the OMG and FITS hunts. Aside: 500+ stores is a tremendous number, and traversing the entire chain would be an unbelievably momentous feat. Even more astounding would be the effort required to sort through 500+ gift items, which I suspect almost no one actually does. The analysis is straightforward: using the SL transaction log, capture the names of all unique avatars who purchased the SL Discovery hunt item. These individuals were clearly in my store, at least briefly. Then compare these names to the names of those who purchased any other items during the same period. This should catch any hunters who happened to purchase something while hunting, or even those who returned afterward to shop. There is a possibility that someone may have purchased something before they were hunting, but as you’ll see, that’s highly unlikely. In other words, only 1.3% of the hunters actually purchased something. I must say the traffic was fairly large, but even so the amount of sales was tiny compared to the traffic. How did the two other smaller hunts fare? Even worse. The conversion rate for the FITS hunt was only 0.9% and the OMG hunt was an even lower 0.7%. Total sales were reasonable from the high-volume SL Discovery hunters, but dismal for the other two hunts due to far less volume (346 and 536 hunters, respectively). Will I be doing further hunts in the future? Possibly, if the hunt’s theme is more directly related to my product line and it’s high-volume. But how to find them? That’s a whole other story. Oh, you’re wondering what the chart is at the top? It’s the frequency of visitors for the SL Discovery hunt over two months by day. More than half of the traffic comes through the first week and then it drops off quite drastically, but that’s likely because I was #23 on the hunt. Good thing I wasn’t #532. BuilderBot Is Coming: Should You Be Worried? The answer, I think, is maybe. What is BuilderBot? It’s a new opensource utility created by virtual construction company Rezzable, who’ve recently begun moving their operations from the Second Life Grid to OpenSim. BuilderBot is being released as Opensource code - meaning it’s freely available to anyone who wishes to use it. BuilderBot does not recognize any permissions on sim objects. In other words, in theory you could quickly obtain BuilderBot, go to any SL Sim and essentially take a copy of the entire sim - whether it’s yours or not. It’s great if your intention is to migrate your operations to OpenSim, but perhaps not so great for SL shop owners who want to continue operating in SL. They might find a duplicate of their shop appear suddenly somewhere else on the grid. Yes, this is similar to CopyBot, which currently exists and is apparently used by the bad guys, but BuilderBot might be easier to use to capture a sim’s content. BuilderBot does not capture scripts. Therefore any item that is scripted would have only it’s containing object captured. Thus, vehicles, games (and particle effects, yay!) are not really affected. BuilderBot captures the data into a file that can be imported to any OpenSim grid. But you cannot import it to SL unless you purchase their “Pro” version, that may cost around USD$100. Casual thieves may not consider this an option. I’m not sure, but I suspect you’d have to have control of an empty sim in order to restore captured data. This also means you wouldn’t get casual thieves doing this, since they’d have to commit to paying the outrageous USD$295 per month for a sim. For all the details (and they are quite preliminary at this stage), you might want to read Rezzable’s post on this. Clearly, this is going to be quite disturbing for many shop owners, and probably Linden Lab as well, because they’re likely going to be deluged with content issues. It's a question I ask myself now and then, simply because of all the insane and unbelievable situations I find myself in lately. If you can't explain it to your mom, is it because it's too hard to explain, or because you're actually doing crazy things? And does that mean you are crazy? I began pondering this question after watching a rather good machinima from Pooky Amsterdam, "Shrink Wrapped", in which a typical avatar consults a psychiatrist regarding her increasingly bizarre SL behavior. The main character enters SL for typical and conventional reasons, but then as social activities increase, the avatar reacted by creating multiple SL personalities - and mayhem ensued. Adding more personalities just makes things more confusing, as there are more opportunities for conflict between the identities. This is especially likely if you invest more personalty into your alt avatars, as did the avatar in the machinima. I have a couple of alts, but I don't really inject any personality into them; it's as if they're made of cardboard. As a result, I can avoid some of those complex and mentally confusing social situations involving non-cardboard alts. Perhaps I'm not crazy after all? How about you? Do you have alts that have a truly unique personality? Does the constant mental context switching drive you crazy? If so, maybe you need to see Dr. Occam too! Recently I’ve been puzzling over fluctuating revenues at my shop. One theory I had suggested recent decreases in revenue might have something to do with the unemployment rate. However, commenters provided many alternate theories, one of which involved avatars buying other types of products before “my” type of products. I thought about this at length and realized that this could in fact be the case. The more I thought about it, I increasingly saw a connection to the classic “Maslow’s Hierarchy”. What’s that, you ask? Motivation theory which suggests five interdependent levels of basic human needs (motivators) that must be satisfied in a strict sequence starting with the lowest level. And it’s typically represented as a pyramid, where individuals must satisfy their needs at the lower levels before they can seek the benefits of higher levels. As you can see, humans likely have to be able to breath and eat before they’ll worry about making friends and producing sculptures. It seems to me that there might be a corresponding pyramid suitable for avatars. 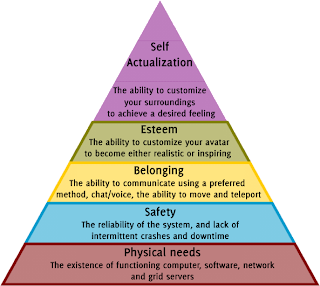 I suspect some of the layers might be similar to Maslow’s, but there are some differences, especially at the bottom of the pyramid. If this pyramid of “Armi’s Hierarchy of Avatar Needs” is true, then it may explain some shopping habits. After first ensuring the basics (Physical, Safety and Belonging), avatars tend to shop for fashions, skins and shapes before seeking gadgets, building supplies and particle effects. Thus, in difficult times one might expect a store such as mine to suffer more than say, a famous skin shop. The pyramid might also explain why people get frantically upset when the grid or PC crashes, and why teleport errors generate so many complaints. The lower levels of needs are more fundamental to avatar existence. There’s one simple reason avatars may act according to a pyramid of needs: behind every avatar is none other than a real, breathing human. Most of the time, anyway.